Being a parent is one of the greatest things that can ever happen to someone, but it does come with its difficulties. I’m talking about wet babies. We all dread that 3 am wake-up cry, which involves nappy changing, wiping, and powdering. Sleep for everyone is so important, so I looked into trying a range of overnight diapers. These are relatively recent releases from some of the biggest diaper brands and what an exciting concept it is. These diapers allow both you and your baby to get a good night's sleep. But which overnight diapers are best for your baby? I’ve detailed my five favorite overnight diapers that are currently available on the market, showing you the best of the best when it comes to this life-changing industry. If you're still not sure which brand is best for you, my step-by-step buying guide will show you everything you need to know about overnight diapers, allowing you to make the best decision for your baby. Are you ready to get a full night's sleep without having to wake up to a crying baby? 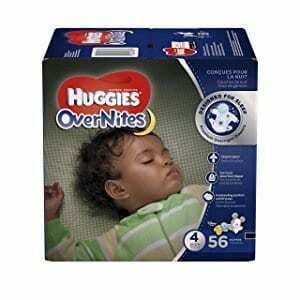 Here are my five favorite overnight diapers that will bring peace to your household. 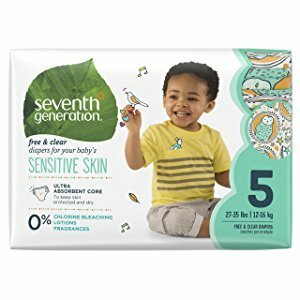 Kicking off my list, I’ve chosen the Seventh Generation Overnight Diapers, which create the ideal protective barrier. These diapers pride themselves on their leak-free technology that helps your baby to stay dry throughout the night. Produced using renewable and sustainable resources, this is a fantastic product that puts your baby and the planet first. Thanks to its unique and super-absorbent design, your baby can enjoy peaceful sleep of up to ten hours without feeling so much as a drop. This is complimented by the comfortable, flexi-fit properties that help to create a leak-free environment while maximizing comfort for your little one. The soft materials used to produce these diapers feel silky soft, almost like cloth, giving your child everything they need for undisturbed sleep. What's Great About It: The best part of this diaper range is how much effort has gone into making this product safe for your baby. In addition to the sustainable materials, each diaper is completely free from traditional chlorinated toxins, reducing the harm to your baby's skin. 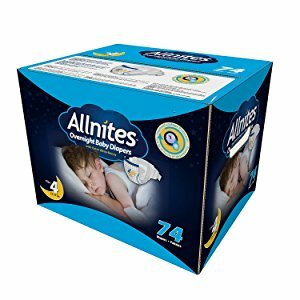 If you’re looking for a high-performance overnight diaper, the Allnites may be the perfect product for you. Professionally designed to be as absorbent as possible, this diaper can give your baby up to 12 hours of protection against natural leakage. Suitable for children between the ages of 2 and 5, this diaper boasts a highly durable waistline and side panels that can stretch to provide a firm yet soft and comfortable fit around your baby’s body. Inside the diaper, you’ll find a super-absorbent core that proactively traps and absorbs any wetness present during the night, enabling your baby’s skin to remain dry so they can sleep as peacefully as possible. Furthermore, this core layer contains natural Aloe Vera which provides a soothing effect on your child’s skin. What's Great About It: Thanks to the Aloe Vera protective layer, this diaper prides itself on its natural, hypoallergenic properties. This helps to keep your baby’s skin clean and healthy while minimizing any kind of irritation, a common problem with traditional overnight diapers. 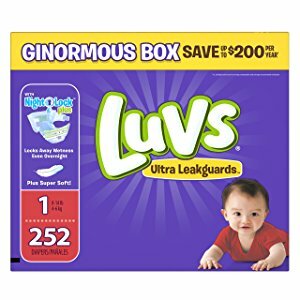 If you need a diaper that’s designed for your newborn baby, the Luvs Ultra Overnight Diapers could be ideal. Thanks to the integrated Nightlock Plus technology, this diaper actively absorbs any moisture that’s present, helping to keep your baby’s skin as dry as possible, enabling them to have undisturbed sleep. In addition to this technology, these diapers also contain a Leakguard core, specially designed to add to the already high levels of absorption. Produced using high-quality materials, these overnight diapers provide a super-soft surface that helps to maximize the levels of comfort. These fantastic diapers are available in a range of sizes alongside a guarantee that you will be completely satisfied with the product. What's Great About It: In addition to these already market-leading features, the Luvs Ultra is designed to have wide yet body-conforming waistlines that provide your baby with a comfortable but protective diaper. These diapers are packed with features that will benefit your baby. Renowned for being the #1 selling overnight diaper, these diapers are designed to be 25% more absorbent than their previous model, giving your baby optimal levels of night time protection against moisture. To increase this level of protection, there is a Double Leak Guard along the inside of the diaper, stopping any excess moisture from escaping. Moisture can sometimes escape as your baby moves in their sleep. This problem is eradicated thanks to the Double Grip Straps that ensures your baby’s diaper stays firmly in place, no matter how active a sleeper your baby is. The multi-layer formula creates a tight yet comfortable seal around your baby while the Leak Lock protection gives you up to 12 hours of non-stop protection. What's Great About It: In addition to the fun Disney designs on every diaper, you can enjoy the added benefits from an advanced Wetness indicator. This shows you exactly when you need to change your baby into a fresh diaper with an easy-to-learn color strip. To conclude my list, I’ve chosen another industry leading brand that’s become a household name. These diapers pride themselves on their three specially designed layers of moisture protection. These three layers give your baby 3x the traditional level of absorbency, ensuring your baby remains undisturbed throughout the night. Available in a variety of sizes, these diapers contain an advanced color changing strip that reacts to moisture in the diaper. This allows you to know exactly when to change your baby’s diaper without having to wake them up to check. The soft materials and elastic edges help to create a snug fit, putting your baby’s comfort and sleep levels first, ideal for their health. What's Great About It: Alongside the three-layer design, the inner core of these diapers contains three specially designed moisture channels. These channels help to direct moisture to the absorbent areas of the diaper, giving your child up to 12-hours of moisture protection. Not sure where to start when choosing an overnight diaper for your baby? Follow my buying checklist below that details everything you need to know about overnight diapers. When it comes to overnight diapers, there are two main aspects you’ll want to consider for the sake of your baby - comfort and protection. Both of these can be achieved to the highest quality depending on how many layers your preferred overnight diaper has. Traditionally, most overnight diapers will have two layers, one on the outside with an absorbent side and an internal layer that initially absorbs moisture. The moisture then becomes trapped in between these two layers, keeping your baby’s skin as dry as possible. However, thanks to recent advancements, some leading brands have now released three-layered diapers that are designed to trap moisture even deeper inside the diaper. Not only does this allow the diaper to hold more moisture, increasing the length of time between changes, it also helps to stop moisture escaping and coming into contact with your baby’s skin. Either number of layers will be effective, but if your baby is a heavy wetter, three layers will be ideal. As babies grow up, their body shape and size changes. With this in mind, you’re going to want an overnight diaper that will fit. Choose one too loose and you’ll find moisture will easily escape the diaper, causing a mess for you and your baby. Likewise, if you choose a diaper that is too tight, not only will this be uncomfortable for your baby, it will also force moisture out of the diaper every time your child moves during their sleep. When choosing a brand, always check that there are multiple sizes available. Some brands will offer a complete range from newborns all the way up until the age of five. Alternatively, some may specialize in one age range. As your baby grows, they will need different sizes, so always bear this mind when shopping for your diaper brand. As we all know, a baby’s skin is very delicate and can be easily irritated with certain materials, chemicals or products. This is especially important when it comes to overnight diapers as your baby will be spending extended amounts of time in them, sometimes even up to 12 hours. This is why it’s important to choose safe diapers that have the right materials. Look for soft fabrics that make up the diaper and look into the product descriptions to ensure no harmful chemicals are being used in the product. This won’t be a problem with any of the diapers in my list, and you shouldn’t have a problem with most leading brands. If this issue is a serious concern to you or your baby, always look for a diaper that is made from all-natural products (similar to the first item on my list). These products pride themselves on a complete absence of potentially harmful chemicals and even boast beneficial hypoallergenic properties, another layer of protection for your baby. Ensuring your baby is comfortable in their overnight diaper is essential when it comes to getting a good night's sleep. 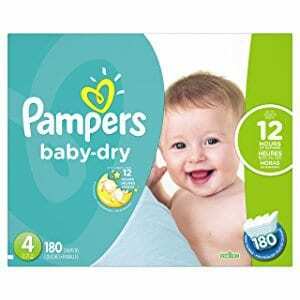 If you’re researching which product is the best for you, by considering the above points, you should naturally find a diaper which boasts high comfort levels. As with any kind of product, the cheaper you buy, the cheaper the quality of the product will be, which is why it’s worth spending that little bit extra. It will benefit you and your baby in the long run. Included on some of the more advanced brands of overnight diapers, color strips have been implemented which change color when they come into contact with moisture. When the color change occurs, it means that the diaper should be changed. This is ideal for sleeping babies as parents can check their baby's diaper without having to wake them up to find out, guaranteeing an even more peaceful sleep. Overnight diapers are possibly one of the most overlooked yet life-changing products to have been produced to help out parents around the world. By doing your research and ensuring you’re buying the perfect diapers for your baby, you can enjoy a peaceful night's sleep, and so can your baby.